The Regency period of furniture history in England extends for at least the first 30 years of the nineteenth century and bears little connection with the actual reign of the Prince Regent, George, 1811-1820. 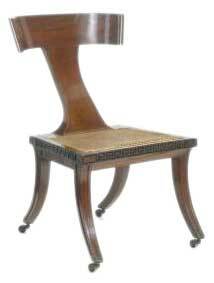 Regency furniture represents, in a sense, the taking of the neoclassical antique style as seen in Robert Adam furniture and his descendants in later Georgian times one step further. While previously the antiques of the ancient civilizations of Greece and Rome were a source of inspiration for furniture designers, in the Regency era attempts are made to make actual copies of ancient furniture, and there is a new interest in the heritage of Egyptian furniture. 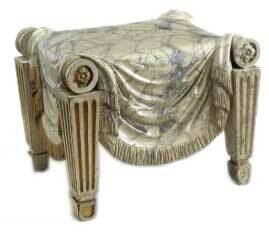 Antique Regency style furniture has plain, slender, elegant lines and avoids shapes and curves for surfaces. The use of carving and elaborate forms of decoration and ornament like marquetry declines. There is a great deal of brass work employed and much use of rosewood and zebrawood, because they allowed striking use of colour in veneers, alongside mahogany, which was still the wood of choice for most library, dining room, and regency bedroom furniture. French polishing came into vogue around 1810 and allowed for smoother finishes. Regency furniture was often covered with woven and printed fabrics particularly chintz. 1800. Beech wood, painted in white and grey in imitation of marble. Copied from a marble seat in Rome. In 1794 the architect Henry Holland sent his designers to Rome to collect classical objects the results of which were published as a collection of drawings, "Etchings of Ancient Ornamental Architecture", in 1799-80. These provided designers and craftsmen with ideas for furniture and other pieces in the classical style of the Regency period. Thomas Sheraton's "Cabinet Dictionary" of 1803 included Grecian couches, animal monopodia, and chairs with legs curving forwards, the "sabre" design, one of the most characteristic of the Regency period. Later in 1804-1806 Sheraton published the first Egyptian designs used in English furniture, in the " The cabinet maker and artist's encyclopedia". Egyptian style Klismos Chair, 1805. In 1807 the designer Thomas Hope published his "Household Furniture and Decoration". Hope attempted to make direct copies or adaptations of classical and ancient furniture using wood and bronze and in doing so commonly used motifs such as the winged Sphinx, winged lions and lion masks, hocked animal legs, griffins, Egyptian heads and gods, and lyres. Regency Armchair, 1804 by George Smith. Buy a reproduction of this chair. Hope's fine regency furniture was fairly large in form, and somewhat serious, and was made more palatable for the mass market by George Smith in his "A Collection of Designs for Household Furniture and Interior Decoration" in 1808, and in 1826 the " The cabinet-maker and upholsterer's guide". Gothic furniture underwent another revival during the Regency era as did Chinese and chinoiserie styles. 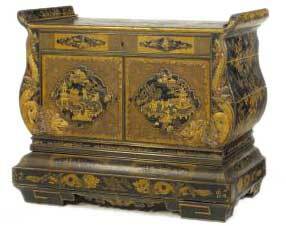 The craze for pseudo Chinese furniture saw the use of much decorative japanning with wing pagoda and dragon motifs, black and gold lacquered furniture and imitation bamboo chairs. 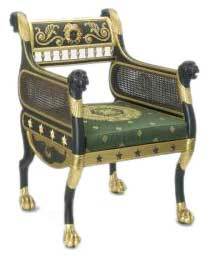 The Gothic is always present in English furniture and saw much popularity in the Regency period. Reproductions and new developments of Gothic pieces were often made by the cabinet makers George Seddon and Sons who supplied Gothic furniture to Windsor Castle, 1827-33. By 1826 the cabinetmaker George Smith complained of the growth of eclecticism, "a melange or mixture of all the different styles associated together". This chaotic swirl of styles is to be found in the Early Victorian age. See also the resources page for Regency period history books.